We are thrilled to be able to offer you this fantastic Euro 4 Dragster RR 17 MY in white and red. Italian flair at its best. Not for the faint of heart, fully focused hyper naked. Stunning looks, superb build quality. Low rate finance is available on this bike, credit subject to acceptance. Mv Agusta's superb 798cc, three cylinder naked roadster. 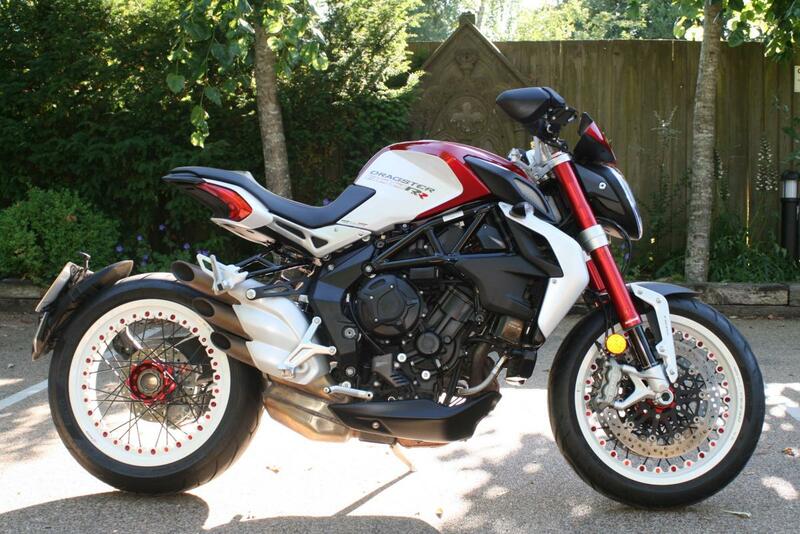 One owner from new, this bike boasts a full Mv Agusta service history and is offered in brilliant condition. Just take a look at it, dripping in unique design features, full of Italian flare and design, an absolute piece of Italian art. Blinged-up version of the Dragster variant of MV’s 800 Brutale, this is truly special. There are cheaper bikes, more manageable bikes, even faster bikes in the same category but this one is special, just look at it! And it goes as well as it looks! Bags of attitude and aggression, this engine is a peach. Fire up the 800cc triple and there’s a real rasp. It sounds lovely, revving quickly and perfectly in tune with its exhaust note. Combine that with clutchless gear changes and intoxicating noise it’s hard not to thrash it. You end up attacking roads not just riding them. Low rate finance is available on this bike, credit subject to acceptance. Please call for a quote. Thanks for looking! !